3) Financial conditions in China deteriorate materially. 2) Australian unemployment falls below 5% and the RBA adopts a more hawkish tone. Let’s just quickly glance through OTC outlook of AUDUSD, before deep diving further into the strategic framework. Please be noted that the positively skewed IVs of 3m tenors signify the hedgers’ interests to bid OTM put strikes up to 0.68 levels which are in line with the above bearish scenarios (refer 1st nutshell). While mounting numbers of bearish risk reversals and bearish neutral RRs of the 3m tenors that are also in sync with the bearish scenarios refer 2nd(RR) nutshell. 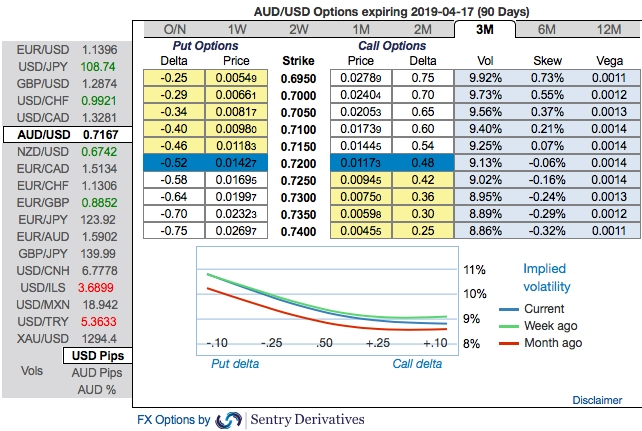 In a nutshell, AUD OTC hedgers’ sentiments substantiate that their risk mitigating activities for the downside risks have been clear. Accordingly, diagonal put spreads are advocated to mitigate the downside risks with a reduced cost of trading. The execution of options strategy: Short 1m (1%) OTM put option with positive theta (position seems good even if the underlying spot goes either sideways or spikes mildly), simultaneously, add long in 2 lots of delta long in 3m (1%) ITM -0.79 delta put options. A move towards the ATM territory increases the Vega, Gamma, and Delta which boosts premium. The rationale: Contemplating all the above factors, we have advocated delta long puts for the long term on hedging grounds, comprising of more number of ITM long instruments and theta shorts with narrowed tenors for 1m shrinking IVs to optimize the strategy. Currency Strength Index: FxWirePro's hourly AUD spot index is inching towards -48 levels (which is bearish), hourly USD spot index was at 57 (bullish), while articulating (at 09:58 GMT).